Since it is a Halloween month Pumpkin is a star vegetable. 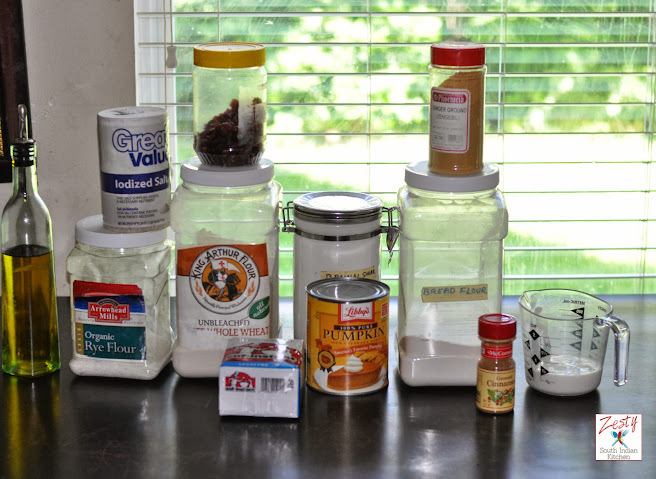 While chatting with Tamy of 3 Sides Crazy last month, she asked me if I had decided on a recipe for Baking Partners Challenge. I told her I had nothing in mind, but that we needed a recipe with pumpkin as it is Halloween month. She immediately selected two recipes, one is loaf recipe and other one is yeasted pumpkin bread recipe from King Arthur flour. Last year we went to visit a pumpkin patch in a church lot, and the kids had lots of fun. However this year we didn’t get the time, may be before this Halloween we can visit a pumpkin patch. My hubby already told me not to buy any small pumpkins if we visit, as I will buy them for using as my food props until they finally go bad. Yesterday I bought a few Halloween cookie cutters from Michael’s as they were on sale. I also wanted to taste pumpkin spice latte from McDonalds, and during my outing last Sunday, bought a medium glass. I couldn’t enjoy the taste as it is too sugary, and it ended up in garbage. So I am search for my favorite version of pumpkin latte, hope I will find it soon. I also have a little amount of pumpkin puree left, and need to try some more pumpkin recipes. If you know any perfect pumpkin latte recipe let me know. Coming back to the recipes from Tammy, I decide to try pumpkin bread recipe, as I love good yeast bread. However King Arthur flour recipe uses only all-purpose flour, however my family likes rye flour, or whole wheat bread. So I mixed bread, rye and white whole wheat flour to make this bread. First I thought of adding nuts, but my kids won’t touch them. Thus I added cranberries to the bread. I also thought of making homemade pumpkin puree, last minute I changed my mind and bought a Libby’s canned pumpkin. When I looked at price of big and small can, I found that buying big can is cheaper so ended up with the big one. I made some pumpkin cookies, now I am looking forward to make a pumpkin latte. 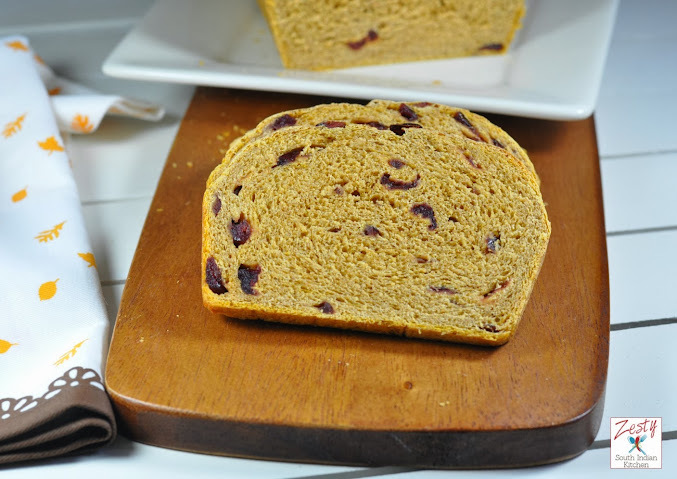 This pumpkin cranberry bread reminds me of my favorite raisin bread. It also remains moist at room temperature for more than 4 days. It is also great as toasting bread. So give it try, it doesn’t have any overpowering taste of pumpkin. Please look at the creations of other Baking Partners too, some have opted for yeast bread, while others have chosen the non-yeast version, there is also some vegan versions. If you want to bake with us next month contact me through the e-mail. In the bowl of kitchen aid stand mixer attached with paddle attachment add yeast, rye, bread and white whole wheat flour mixture, buttermilk, pumpkin, sugar, salt and rest of ingredients and mix everything for 3 minutes. Then add cranberries and mix very well to incorporate into the dough. Then change to dough hook and knead the dough for about 8 minutes or until the dough starts leaves from the sides and form a ball. Then transfer the dough to well floured area and knead for another 5 minutes or until they become shiny, supple, non sticky dough. The dough should pass the window pane test and register 77 to 81 F. If you are kneading by hand it takes about 15 minutes of kneading. Place the dough in a lightly greased bowl, cover the bowl, and allow it to rise till it’s expanded and looks somewhat puffy, about 90 minutes. Lightly grease a 9? x 4? x 3?, 1.5 lb. commercial loaf pan Transfer the dough into a board and gently shape the dough into a smooth log, and settle it into the pan, smooth side up. Cover the pan with lightly greased plastic wrap, and allow the loaf to rise till it’s crowned over the rim of the pan by about 3/4?, about 90 minutes. Don’t let it rise too high; it’ll continue to rise as it bakes. Towards the end of the rising time, preheat the oven to 350°F. When you are ready for baking the score the bread and lightly apply the egg wash on the loaf so that you get shiny color after baking. Bake the bread for 60 minutes. Lightly tent it with aluminum foil, and bake for an additional15 minutes, or until the center registers 200F on an instant-read thermometer. Remove it from the oven, and turn it out of the pan onto a rack. Slice and serve when the bread cools down to room temperature. Enjoy with your favorite spread. Please do not share any recipes if you are not a part of baking partners group , it will be deleted, if you want to join the group please e-mail. I love that your bread is multigrain Swathi! So healthy! Bread looks very hearty, I like your addition of Rye flour. 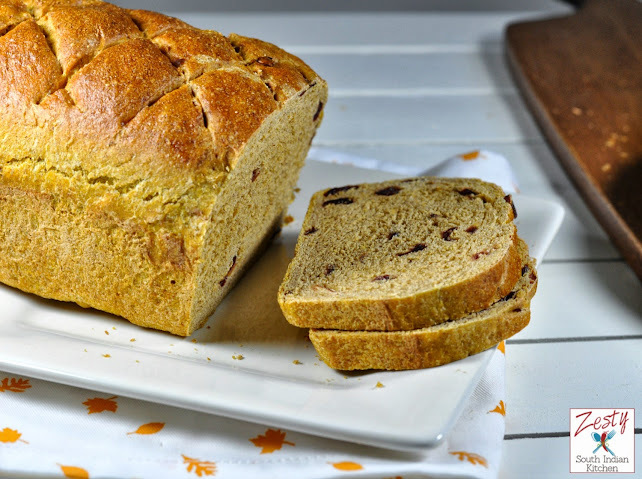 Swathi perfectly baked bread,love this healthy version with cranberries. Mathanga kapi going feature soon as soon as I get whip cream. Beautiful, Swathi!! But I have to admit I’m in love with that fall leaves-themed napkin, so cute!! am planning to bake something with pumpkin for the sonny boy too for this halloween. this breads looks fantastic. bread looks so delicious and awesome yaar,,.,.,. Beautifully done multigrain bread Swathi. Love the healthier version. Beautiful bread Swathi, love it..
Swathi, congratulations on your new change-over to Word Press. Wishing you a lot of success with the new site…as for me, I’ms still with Blogger; seems like a lot of people are making the move! 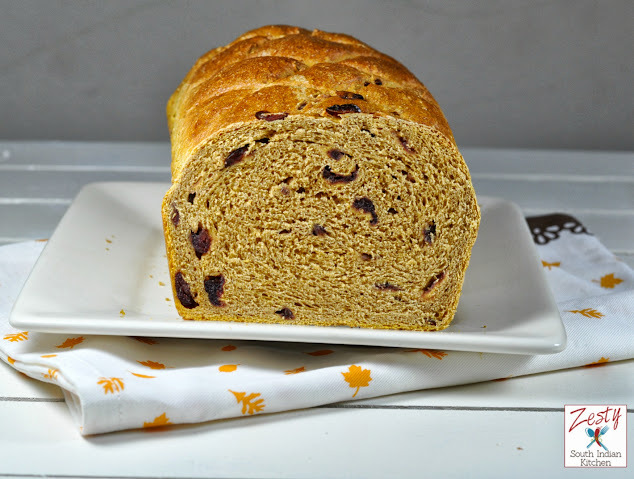 I love your multigrain pumpkin bread, so perfect and incredibly delicious. The photos are superb. Looks like you made yourself right ‘at home’ on Word Press, which is great! Thanks Elisabeth, I wanted to move for long time, Finally did. Glad you liked pumpkin bread. Perfectly baked bread Swathi, love that first pic that tells it all how good it is. You have mastered in bread making !! Thanks Prathibha, I am still learning . You have add as many as healthy stuff in your bread!! and it is the best bread recipe ever..Simply fabulous!!!! 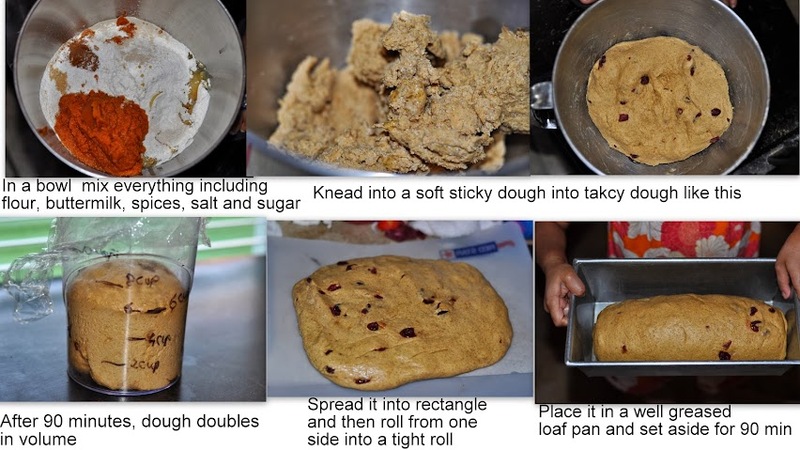 Wow, awesome multigrain bread…. came out really well..
Pumpkin bread looks awesome and delicious. The bread looks perfect, love the bits of cranberries in it Swati. Perfect for fall. Your bread looks delicious Swathi! Love the addition of cranberries and the texture is perfect! 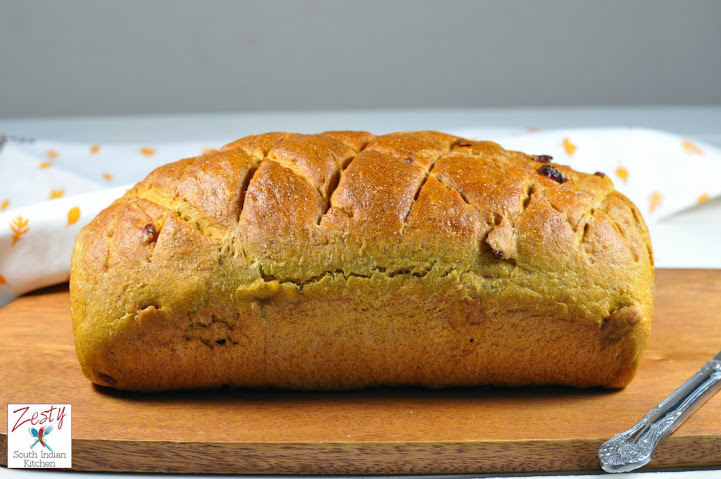 I need to give yeast pumpkin bread a try as I have lots of pumpkin on hand. What a lovely bread. Perfectly made.